The word "weird" gets thrown around a lot at my house, especially when describing movies and television shows. While there is still certainly plenty of "mainstream" entertainment out there, more and more things skew, at least a little, to the alternative. Therefore, every few days, I proclaim something to be "the weirdest thing which I've ever seen". Of course, this is hyperbole, as I've watched some truly bizarre things in my life and most of what I see on a daily basis is merely a little left of center as opposed to being truly unusual. But, that doesn't mean that a truly weird movie doesn't come along every now and then and 1976's The Little Girl Who Lives Down the Lane is truly weird. Jodie Foster stars in The Little Girl Who Lives Down the Lane as Rynn, a 13-year old girl who lives in a large sea-side house with her father, a poet. Except, her father never seems to be around. Mrs. Hallet (Alexis Smith), who oversaw the lease on the house, comes to visit and is shocked by Rynn's refusal to retrieve her father. Mrs. Hallet's son, Frank (Martin Sheen), also stops by, but his motives are far more lecherous and creepy. Rynn befriend Mario (Scott Jacoby), a teenaged boy who has turned to being a magician, as his permanent limp precludes him from joining his brother in sports. As Mario gets to know Rynn better he learns her secrets, and decides that he will help to keep her private life away from prying eyes, no matter what the cost. 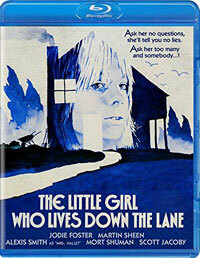 Did I mention that The Little Girl Who Lives Down the Lane is a weird movie? Based on a novel by Laird Koenig, the movie feels more like it came from a stage play, as the bulk of the movie takes place in Rynn's living room area. Save for a scene in which Rynn goes to the bank and a montage of Mario going through town, the action rarely strays far from Rynn's house, and one could easily see this entire story occurring on one set. Given this structure, the movie plays like a series of vignettes in which the above mentioned characters, along with local policeman, Miglioriti (Mort Shuman), come by to visit Rynn. For Mario and Miglioriti, these encounters are pleasant, but with the Hallets, things become very strained. The 1970s were known for moody, quirky movies, but even for that era, The Little Girl Who Lives Down the Lane comes off as unusual, especially given its familiar cast. (Keep in mind that it was around this time that Foster received her first Oscar nomination.) The movie is incredibly slow paced and the redundancy of the storyline doesn't help, but there's something compelling about it. Director Nicolas Gessner spools things out at an intentional rate, as we slowly learn more and more about Rynn's strange predicament. The movie contains a few shocking moments, with the first coming in the first act. This sends a message that anything can happen in this wacky movie. The movie also garners attention for the acting. Foster is solid in the lead role, and she's basically in every scene of the movie. Sheen does a terrific job playing a manic creep. By 1976, horror movies featuring children were very much in vogue, thanks to the runaway success of The Exorcist and The Omen. Therefore, it's not completely surprising to learn that The Little Girl Who Lives Down the Lane was marketed as a horror film, but it's not. This is very much a dialogue and character driven drama which just happens to feature a few moments of violence. Instead of something supernatural, we get a very melancholy piece which examines what life would be like for a teenager who was asked to assume many responsibilities. Yes, it's very melodramatic at times and the dialogue borders on campy, but the movie isn't afraid to be completely different and this makes it worth checking out. The Little Girl Who Lives Down the Lane wins an award for repeating the line "Where's your father?" the most times on Blu-ray Disc courtesy of Scorpion Releasing. The film has been letterboxed at 1.85:1 and the Disc contains an AVC 1080p HD transfer which runs at an average of 35 Mbps. Things don't get off to a very good start, as the opening credits are covered by a notable sheen of grain. However, once they finish, we are treated to an image which features on very, very mild grain and only a few defects from the source materials. The colors are slightly muted, but still look fine, and the image is never overly dark or bright. The level of detail is notable and the depth looks good. The Disc carries a DTS-HD Master Audio 2.0 track which runs at 48 kHz and an average of 1.9 Mbps. The track provides clear dialogue and sound effects. There's not much here in the way of dynamic sound effects, but the dialogue is always audible and it's never over-powered by the score, which seems to have escaped from an Italian movie. The Little Girl Who Lives Down the Lane Blu-ray Disc contains a variety of extra features. We begin with an AUDIO COMMENTARY from Director Nicholas Gessner. "Back Down the Lane" (27 minutes) is a modern-day interview with Sheen who goes into great detail about the making of the film, sharing anecdotes about Glessner and Foster. This interview then continues with Sheen and Glessner talking via Skype (6 minutes). Due to the angle of the computer, we can't see Glessner and he's difficult to hear, so it's sort of awkward. The extras are rounded out by the ORIGINAL TRAILER for the film, which definitely has a horror film feel to it.